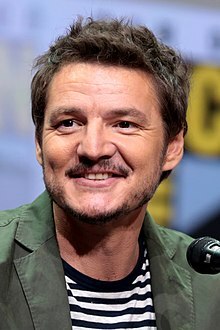 José Pedro Balmaceda Pascal (born April 2, 1975), known professionally as Pedro Pascal, is a Chilean-American actor. He is best known for playing the roles of Oberyn Martell in the the HBO series Game of Thrones and Javier Peña in the Netflix series Narcos. In March 2018, Pascal was cast in the DC Extended Universe movie Wonder Woman 1984 (2019). ↑ Martin, Rebecca (June 29, 2013). "Who Is Pedro Pascal? 5 Things to Know About Oberyn Martell Actor". Wetpaint. Retrieved June 30, 2013. ↑ Kroll, Justin (March 28, 2018). "'Narcos' Star Pedro Pascal Lands Key Role in 'Wonder Woman' Sequel (EXCLUSIVE)". Variety. Retrieved May 29, 2018. This page was last changed on 8 April 2019, at 13:51.